The sewing machine revolutionized the clothing industry, making it possible for women to afford high fashion. Just before and during the US Civil War, womens hoops reached their ultimate width. 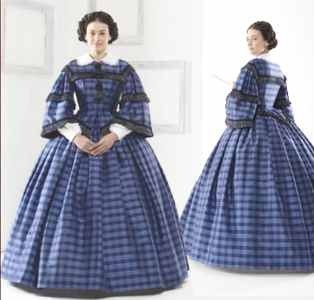 Dresses very often were manufactured with two bodices: one with a high neckline and long sleeves for daytime wear and a second with low neckline and small sleeves for evening. Silks were used for both day and evening wear. #V131 Bodice has 3/4 length sleeves with white engageantes (false undersleeves), contrasting trim and rounded collar. Skirt is full and is deisigned to wear with a hoopskirt.